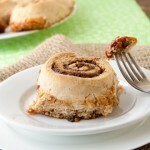 Gluten-free and dairy-free cinnamon buns with a gooey caramel bottom. Place caramel bottom ingredients in a small saucepan and bring to a simmer on medium-low heat. Continue to stir for 1 minute or so, until bubbles form. Remove from heat and pour into the bottom of a greased 9×13 pan. When I make this recipe again, I’ll use a smaller pan so that the rolls don’t spread out too much. A 9×9 would have been perfect. Set aside. Prepare cinnamon sugar by combining ingredients in a small bowl. Set aside. In the bowl of your stand mixer or food processor with the dough blade, mix all dry ingredients until combined. Add in coconut oil, egg, apple sauce, vinegar and vanilla. Turn on your mixer. Slowly pour in warmed milk, scraping down the bowl as needed. Meanwhile, lay out a large piece of plastic wrap on a clean counter. You’ll want the plastic wrap to be about 10?x18?. Lay the ball of dough on top of the prepared plastic wrap and cover with a second piece of the same size. Use brown rice flour for extra dusting as needed. Pat the dough down to a rectangle shape before rolling out with a rolling pin and getting it to about 8?x16?. Remove the top plastic wrap and spread cinnamon sugar across the surface. Leave 1? of one of the long edges free from cinnamon sugar. 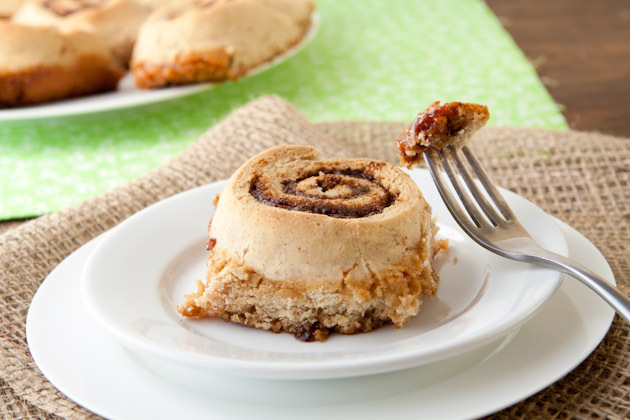 Begin rolling the rectangle into a long cylinder shape by starting with the long edge that has the cinnamon sugar to the end. Seal using the end section that doesn’t have cinnamon sugar on it. Using a long piece of thread, cut the cylinder into 1.5? wide rolls by sliding the thread underneath the roll, lifting it over the top so that both ends of the thread meet, crossing them past one another and pinching the dough with it. Repeat so that you have 10 rolls when all is said and done. Place rolls cut side up and squish slightly with your hands so that everything touches and rolls are about 1?. Cover with a clean cloth and place in a warm, draft free place for 30 minutes. I placed them in the oven with the light on. Just remember to remove them before you start the preheating! Bake in preheated 350F oven for 20-25 minutes, or until golden. Mine were perfect at the 25 minute mark.